It's a gladius founded at the river Rhin near Mainz. I have maked both the sword and the scabbard. 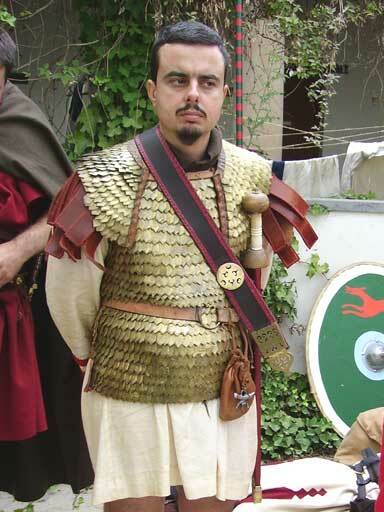 Sword blade was made by a local armourer: Mr Antonio Prades. It has the typical rhomboidal section. 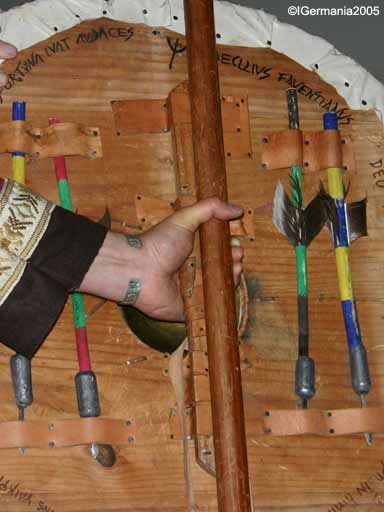 The grip is a cow's bone (metapodia) and guard and pommel are from a hard wood. To make the plates and chape of the scabbard i have used brass, like the original. I don't want to tin or silver coat the metal, because original ones seems to be unsilvered/untined. Decorative patterns (Mars, Victoria, etc)are made with a chisel and a jeweler's saw. I don't want to use a dremel tool. I have to put the suspension bands, the original ones was missed. I have made it with some rods and hammering/annealing work. The scabbard are made with thin wood with a red tanned leather cover. I'll post more things of my equipment next times. I don't have good photos of most of my things. That cingulum are based in an near complete set of 4 apron founded at a grave in Aznalcazar (Sevilla, Spain). Another one, practically identical was founded at Caerleon: M.C. Bishop, "Early imperial apron", JRMES, 3, 1992, Fig. 16, 97. 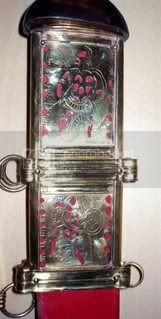 Are made of a 1 mm plate of brass cutted with a jeweller's saw and then punched to make the floral decoration. Very dificult was to do the rivetting with that very little nails! And the Galla Placidia's jewellry.